we were pretty busy this weekend with rehearsals for the two shows that we are working on right now. unfortunately, we didn't get to see much of each other this weekend. however, we did manage to carve out a little time on saturday morning to have breakfast together at home before we had to run out the door. we are such pancake fanatics, so of course pancakes were on the menu for saturday morning's breakfast. 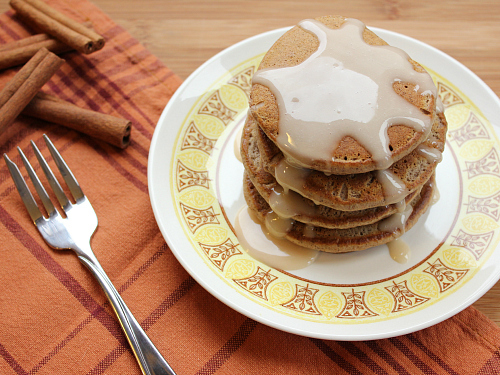 one of our favorite pancake recipes would have to be these cinnamon swirl pancakes. we have made them countless times and absolutely love them. 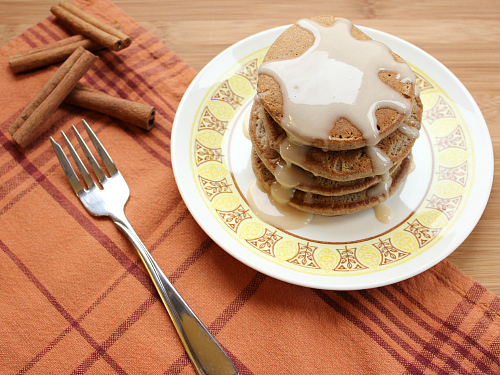 we were flipping through adrianna adarme's pancakes cookbook on saturday morning, and saw a recipe for cinnamon bun pancakes. we knew we just had to try them. 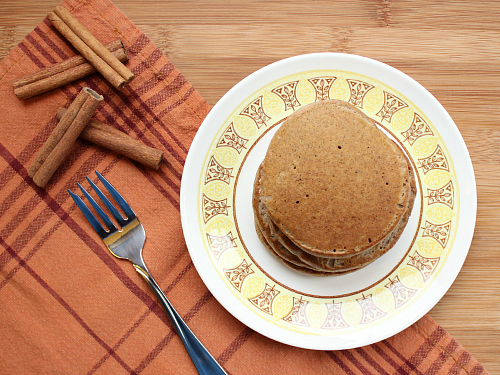 these pancakes are different than the cinnamon swirl pancakes that we have made in the past, because they have cinnamon mixed right into the pancake batter so the cinnamon is evenly distributed throughout the pancakes. they have such a great flavor. 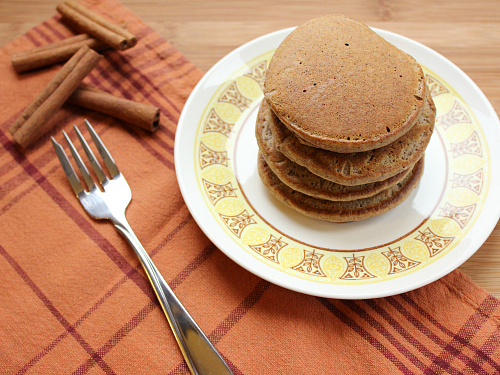 if you don't have time to make traditional cinnamon buns, these pancakes are a great alternative! these pancakes are good by themselves, but they are even better with vanilla glaze on top of them. yum! in a medium bowl, combine the flour, sugar, baking powder, baking soda, and cinnamon. in a separate bowl, whisk together the buttermilk, vanilla, egg, and melted butter. add the wet ingredients to the dry ingredients and whisk until no lumps remain. heat a lightly buttered griddle or frying pan on medium heat. pour 3 tablespoons of batter onto the griddle for medium pancakes. cook for 3 minutes, until small bubbles begin to form. flip the pancakes when they start to bubble, then cook for 2 minutes, until they are golden brown and cooked throughout. once cooked, transfer the pancakes to a baking sheet and place in a preheated 200 degree F oven to keep warm while you cook the remaining pancake batter. serve warm with glaze. to make the glaze, whisk the powdered sugar, milk, and vanilla together in a small bowl until smooth. I have been wanting to make cinnamon buns lately but have not found the time. 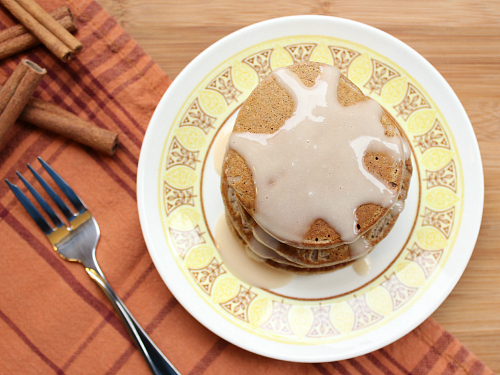 This looks like a great, quick recipe to curb the craving for cinnamon buns. Thanks for sharing at Family Fun Friday this week! Featuring you tomorrow...hope you'll stop by again and link with us.